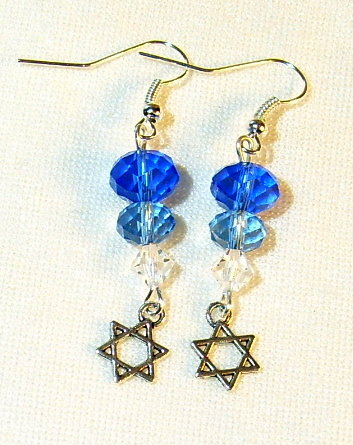 These beautiful Chanukah earrings by Desert Kipah are 3 Tiered Sapphire, light blue, and clear crystal. Designed by Diane Fuller of Desert Kippot, they are part of our Desert Kipah collection. Chanukah earrings by Desert Kippot are an excellent gift for Chanukah, Bat Mitzvah, or any occasion. You may select stones of different colors. Please contact Jewish Bride.